Pilsbry, H.A. & J. Bequaert. 1927. 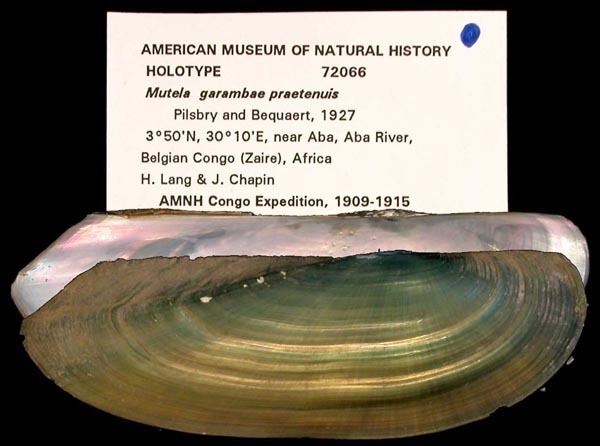 The aquatic mollusks of the Belgian Congo, with a geographical and ecological account of Congo malacology. Bulletin of the American Museum of Natural History 53: 69-602. 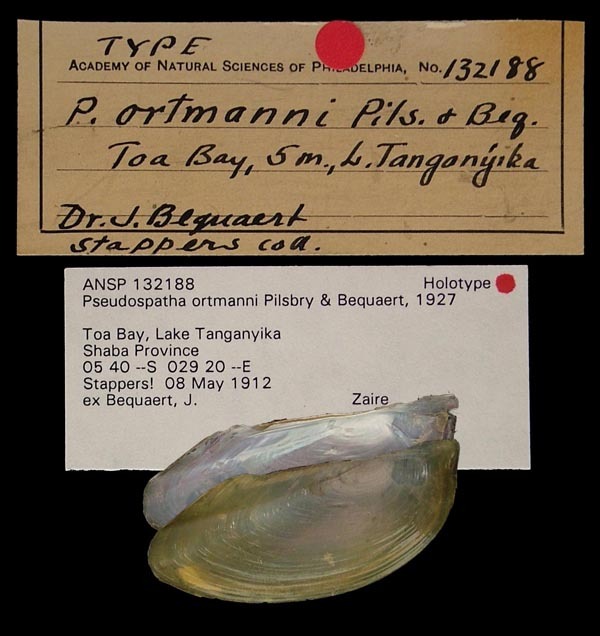 Aspatharia luapulaensis Pilsbry & Bequaert, 1927. Dautzenberg & Germain Of Authors. Pilsbry & Bequaert, 1927, Bull. AMNH: pl. 36, figs. 4-4a [as ‘Aspatharia sp.’] [MS]. Type(s): MANUSCRIPT NAME IRSNB_MP_0333, La Luapula, a Kasenga. Aspatharia (s.s.) chapini Pilsbry & Bequaert, 1927. Pilsbry & Bequaert, 1927, Bull. AMNH: 416, pl. 34, figs. 4-4a; pl. 42, fig. 3. 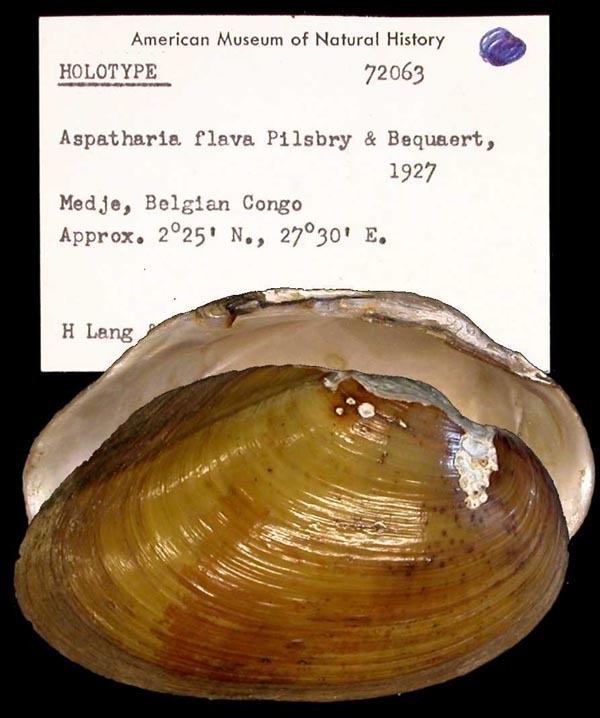 Aspatharia (s.s.) flava Pilsbry & Bequaert, 1927. Pilsbry & Bequaert, 1927, Bull. AMNH: 418, pl. 43, figs. 3-3a; pl. 44, figs. 2-2a. 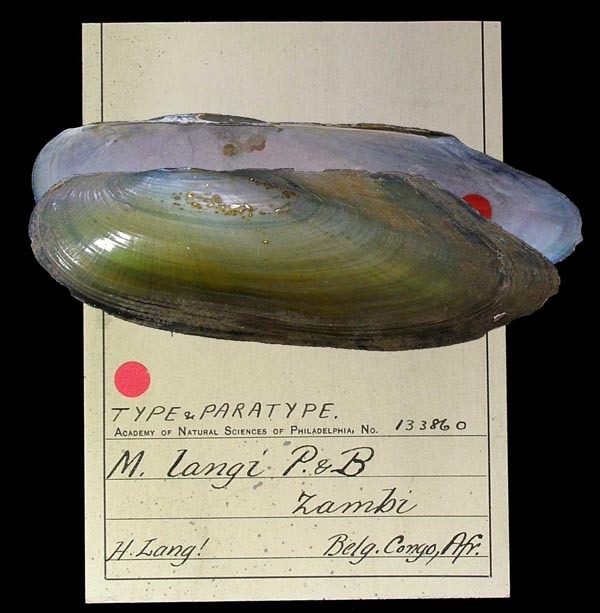 Type(s): HOLOTYPE AMNH_72063, Medje, Africa. Aspatharia (Spathopsis) wissmanni bangalorum Pilsbry & Bequaert, 1927. Dautzenberg & Germain, 1914, Rev. Zool. Afr. : 68 (in part). Pilsbry & Bequaert, 1927, Bull. 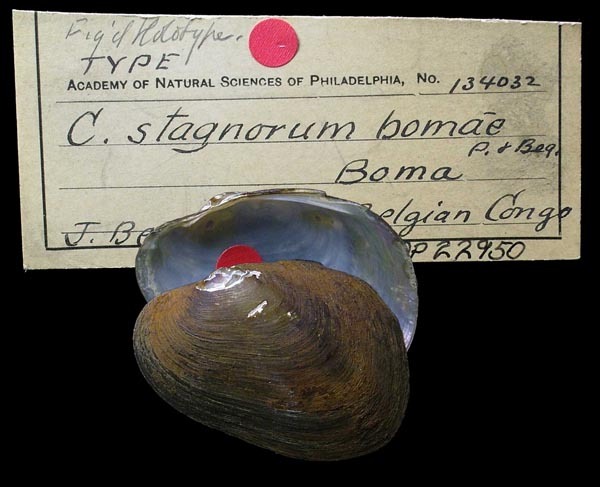 AMNH: 424, text fig. 93. 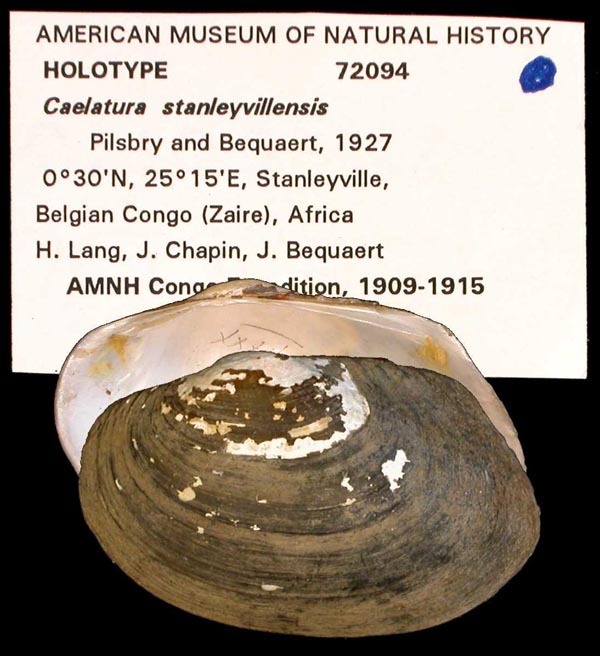 Type(s): HOLOTYPE ANSP_134026, Malema, Belg. Congo. Caelatura (Laevirostris) stagnorum bomae Pilsbry & Bequaert, 1927. Pilsbry & Bequaert, 1927, Bull. AMNH: 405, pl. 33, figs. 2-2a. Type(s): HOLOTYPE (ORIG. DESIG.) ANSP_134032, Boma, Belgian Congo. Caelatura (Laevirostris?) rotula Pilsbry & Bequaert, 1927. Pilsbry & Bequaert, 1927, Bull. AMNH: 405, pl. 33, figs. 5-5a. Type(s): HOLOTYPE (ORIG. DESIG.) ANSP_133847, Leopoldville, Africa. Caelatura (s.s.) mesafricana Pilsbry & Bequaert, 1927. Pilsbry & Bequaert, 1927, Bull. AMNH: 402, pl. 32, figs. 2-2a. Type(s): HOLOTYPE (ORIG. DESIG.) AMNH_72093, Garamba River, 04°10’N, 29°40’E, Belgian Congo [Zaire], Africa. Caelatura (s.s.) stanleyvillensis Pilsbry & Bequaert, 1927. Pilsbry & Bequaert, 1927, Bull. AMNH: 403, pl. 32, figs. 3-4; pl 33, fig. 3. 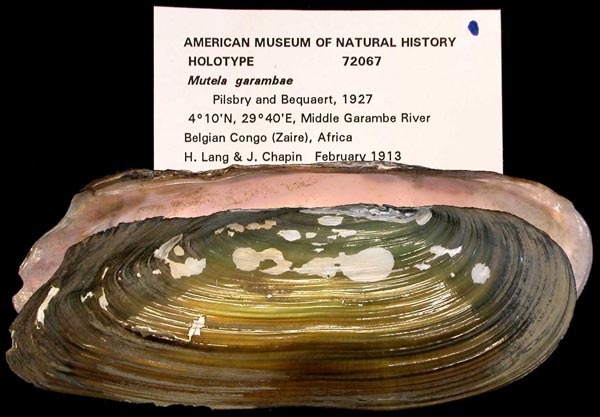 Type(s): HOLOTYPE AMNH_72094, Congo River at Stanleyville, Belgian Congo. Cameronia gosseti Pilsbry & Bequaert, 1927. ‘Bourguignat’ Pilsbry & Bequaert, 1927, Bull. AMNH: 441. 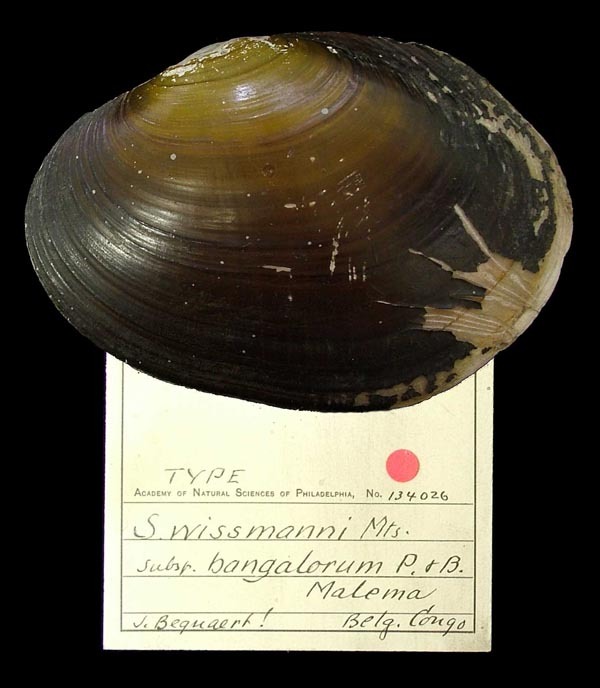 Corbicula radiata Pilsbry & Bequaert, 1927. Pilsbry & Bequaert, 1927, Bull. AMNH: fig. 71d-f “oval form” [in part]. 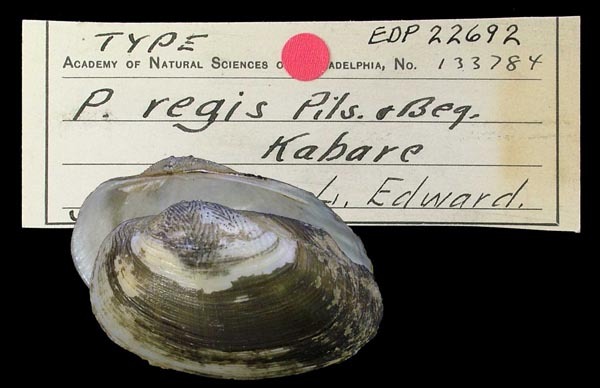 Corbicula radiata edwardi Pilsbry & Bequaert, 1927. Pilsbry & Bequaert, 1927, Bull. AMNH: 343, figs. 73a-b. Cyrenoidea rosea brevidentata Pilsbry & Bequaert, 1927. Pilsbry & Bequaert, 1927, Bull. AMNH: 376, fig. 85. Egeria nux Pilsbry & Bequaert, 1927. Pilsbry & Bequaert, 1927, Bull. AMNH: 367, pl. 29, figs. 4-7. Egeria tenuicula langi Pilsbry & Bequaert, 1927. Pilsbry & Bequaert, 1927, Bull. AMNH: 366, pl. 29, fig. 1-3. Eupera mediafricana Pilsbry & Bequaert, 1927. Pilsbry & Bequaert, 1927, Bull. AMNH: 355, figs. 79a-f, 80a. Eupera mediafricana etheriarum Pilsbry & Bequaert, 1927. Pilsbry & Bequaert, 1927, Bull. AMNH: 357, figs. 80b-d.
Iphigenia congo Pilsbry & Bequaert, 1927. Pilsbry & Bequaert, 1927, Bull. AMNH: 373, figs. 83a-c.
Mutela (s.s.) garambae Pilsbry & Bequaert, 1927. Pilsbry & Bequaert, 1927, Bull. AMNH: 431, pl. 40, figs. 1-2. Type(s): HOLOTYPE (ORIG. DESIG.) AMNH_72067, Middle Garambe River, Belgian Congo (Zaire), Africa. Mutela (s.s.) iris Pilsbry & Bequaert, 1927. Pilsbry & Bequaert, 1927, Bull. AMNH: 434, pl. 41, figs. 2-2a. 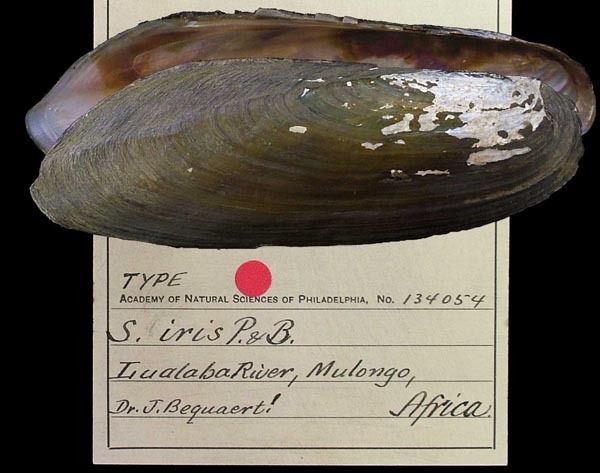 Type(s): HOLOTYPE ANSP_134054, Lualaba River, Mulongo. Mutela (s.s.) langi Pilsbry & Bequaert, 1927. Pilsbry & Bequaert, 1927, Bull. AMNH: 432, pl. 39, fig. 3-3b. Type(s): HOLOTYPE (ORIG. DESIG.) ANSP_133860, Zambi, Belg. Congo, Afr. Mutela (s.s.) garambae praetenuis Pilsbry & Bequaert, 1927. Pilsbry & Bequaert, 1927, Bull. AMNH: 432, pl. 40, fig. 3 [as ‘prætenuis’]. Type(s): HOLOTYPE (ORIG. DESIG.) AMNH_72066, Aba River, Africa. Parreysia mweruensis Pilsbry & Bequaert, 1927. ‘Smith’ Pilsbry & Bequaert, 1927, Bull. AMNH: pl. 31, fig. 8. Parreysia regis Pilsbry & Bequaert, 1927. Pilsbry & Bequaert, 1927, Bull. AMNH: 389, pl. 31, figs. 12-12b. Type(s): HOLOTYPE (ORIG. DESIG.) ANSP_133784, Lake Edward, Kabare. Pisidium katangense Pilsbry & Bequaert, 1927. Pilsbry & Bequaert, 1927, Bull. AMNH: 353, figs. 78a-b. Conrad, 1834, Jour. Acad. Nat. Sci. : 180. Hanley, 1843, Illustr. Descr. Cat. Rec. 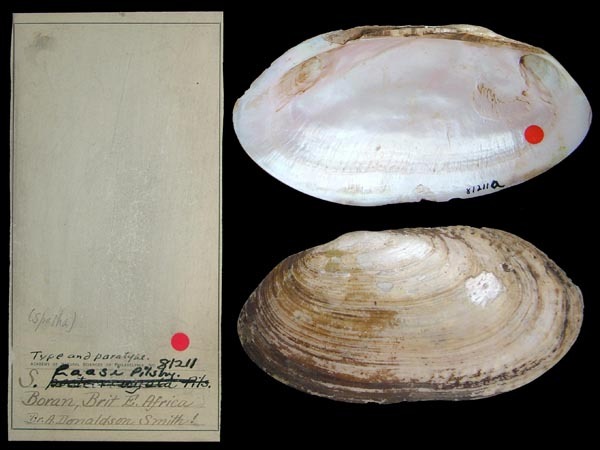 Bivalve Shells: 225. Mörch, 1853, Cat. Conch. Yoldi: 49. Pilsbry & Bequaert, 1927, Bull. AMNH: 443. Haas, 1969, Das Tierreich: 601. Mandahl-Barth, 1988, Studies on African Freshwater Bivalves: 57. Daget, 1998, Cat. 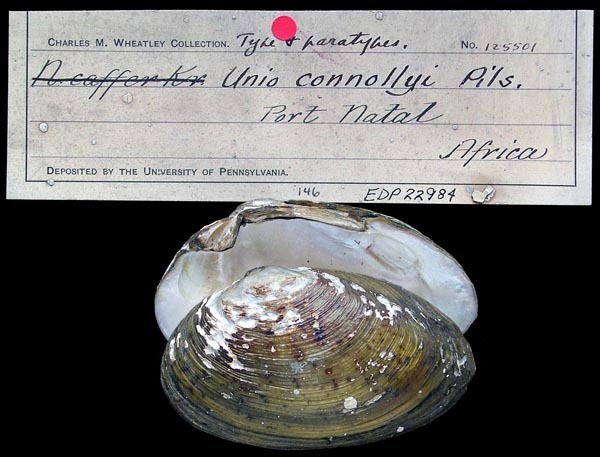 Bivalves Africains: 151. Pseudospatha ortmanni Pilsbry & Bequaert, 1927. Pilsbry & Bequaert, 1927, Bull. AMNH: 446, pl. 45, figs. 5, 7. Type(s): HOLOTYPE (ORIG. DESIG.) ANSP_132188, Toa Bay, 5 m., L. Tanganyika, Shaba Province, 05 40 S; 029 20 E.
Pseudospatha stappersi Pilsbry & Bequaert, 1927. Pilsbry & Bequaert, 1927, Bull. AMNH: 446, pl. 54, fig. 6. 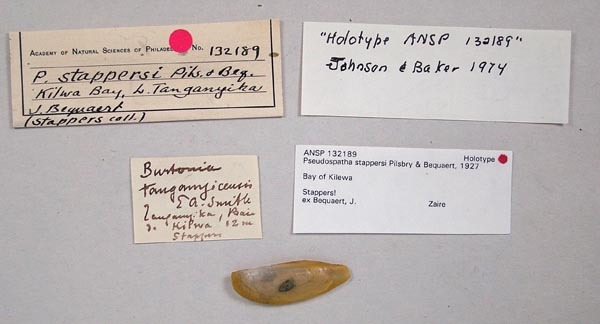 Type(s): HOLOTYPE ANSP_132189, Kilwa Bay, L. Tanganyika. Pilsbry, 1923, Proc. Acad. Nat. Sci. : 275, pl. 19, figs. 1-2. Pilsbry & Bequaert, 1927, Bull. AMNH: 420. Type(s): HOLOTYPE (ORIG. DESIG.) ANSP_81211, Boran, British East Africa. Sphaerium stuhlmanni Pilsbry & Bequaert, 1927. ‘E. v. Martens’ Pilsbry & Bequaert, 1927, Bull. AMNH: 348, figs. 75a-d.
Unio eurysellinus Pilsbry & Bequaert, 1927. Pilsbry & Bequaert, 1927, Bull. AMNH: 381. Haas, 1969, Das Tierreich: 175. Daget, 1998, Cat. 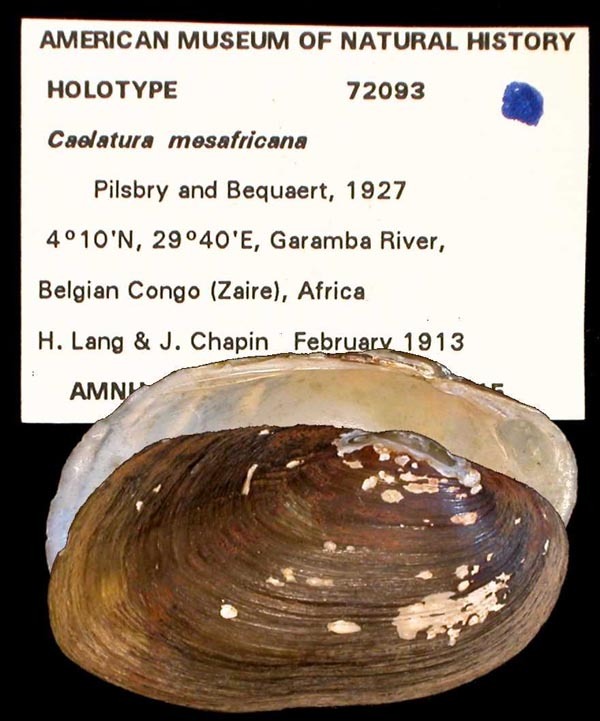 Bivalves Africains: 26. Unio fayumensis Pilsbry & Bequaert, 1927. Unio (Cafferia) connollyi Pilsbry, 1923. Pilsbry, 1923, Proc. Acad. Nat. Sci. : 276, text fig. 1; pl. 19, figs. 3-4. Pilsbry & Bequaert, 1927, Bull. AMNH: 380. Type(s): HOLOTYPE (ORIG. DESIG.) ANSP_125501A, Port Natal, Africa. Aspatharia (Arthropteron) ouassouloui (Rochebrune, 1904). — Pilsbry & Bequaert (1927: 426). Aspatharia (Brazzaea) anceyi (Bourguignat, 1885). — Pilsbry & Bequaert (1927: 426). Aspatharia (Moncetia) lavigeriana (Bourguignat, 1886). — Pilsbry & Bequaert (1927: 427). Aspatharia (s.s.) chapini Pilsbry & Bequaert, 1927. — Pilsbry & Bequaert (1927: 416). Aspatharia (s.s.) corrugata (Dautzenberg, 1893). — Pilsbry & Bequaert (1927: 413). Aspatharia (s.s.) dahomeyensis (Lea, 1859). — Pilsbry & Bequaert (1927: 413). Aspatharia (s.s.) decorsei (Germain, 1904). — Pilsbry & Bequaert (1927: 413). Aspatharia (s.s.) decorsei var. persinuata (Germain, 1907). — Pilsbry & Bequaert (1927: 414). Aspatharia (s.s.) divaricata (von Martens, 1897). — Pilsbry & Bequaert (1927: 414). Aspatharia (s.s.) droueti (Chaper, 1885). — Pilsbry & Bequaert (1927: 414). Aspatharia (s.s.) droueti var. roseotincta (Dautzenberg, 1921). — Pilsbry & Bequaert (1927: 414). Aspatharia (s.s.) flava Pilsbry & Bequaert, 1927. — Pilsbry & Bequaert (1927: 418). Aspatharia (s.s.) fourtaui (Pallary, 1903). — Pilsbry & Bequaert (1927: 414). Aspatharia (s.s.) kamerunensis (Walker, 1910). — Pilsbry & Bequaert (1927: 414). Aspatharia (s.s.) mabillei (Jousseaume, 1886). — Pilsbry & Bequaert (1927: 414). Aspatharia (s.s.) mabillei var. mamounensis (Germain, 1907). — Pilsbry & Bequaert (1927: 414). Aspatharia (s.s.) pfeifferiana (Bernardi, 1860). — Pilsbry & Bequaert (1927: 414). Aspatharia (s.s.) protchei (Rochebrune, 1886). — Pilsbry & Bequaert (1927: 415). Aspatharia (s.s.) rugifera (Dunker, 1858). — Pilsbry & Bequaert (1927: 414). 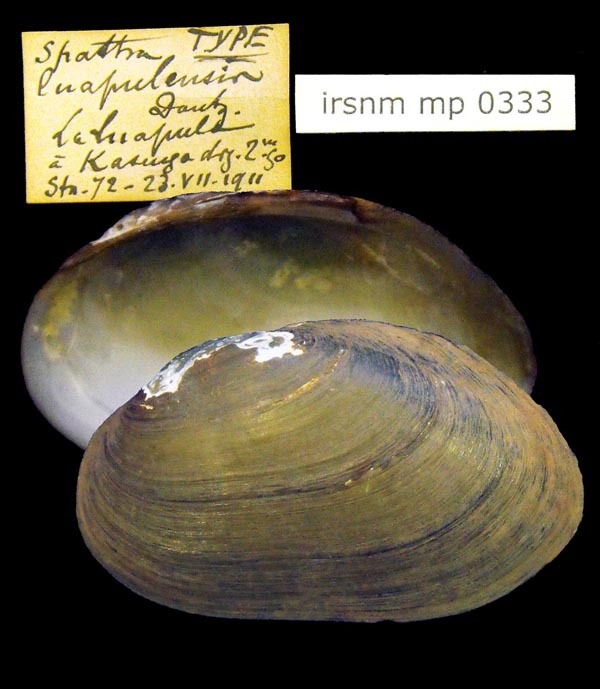 Aspatharia (s.s.) sarae (Preston, 1913). — Pilsbry & Bequaert (1927: 414). Aspatharia (s.s.) semicorrugata (Preston, 1910). — Pilsbry & Bequaert (1927: 419). Aspatharia (s.s.) sinuata (von Martens, 1883). — Pilsbry & Bequaert (1927: 417). Aspatharia (s.s.) stuhlmanni (von Martens, 1897). — Pilsbry & Bequaert (1927: 419). Aspatharia (s.s.) stuhlmanni var. comoensis (Germain, 1908). — Pilsbry & Bequaert (1927: 415). Aspatharia (s.s.) subreniformis (Sowerby, 1867). — Pilsbry & Bequaert (1927: 415). Aspatharia (Spathopsis) adansoni (Jousseaume, 1886). — Pilsbry & Bequaert (1927: 419). Aspatharia (Spathopsis) adansoni var. major (Germain, 1917). — Pilsbry & Bequaert (1927: 420). Aspatharia (Spathopsis) anataria (Cristofori & Jan, 1832). — Pilsbry & Bequaert (1927: 420). Aspatharia (Spathopsis) arcuta (Cailliaud, 1823). — Pilsbry & Bequaert (1927: 420). Aspatharia (Spathopsis) baikii (Adams, H., 1866). — Pilsbry & Bequaert (1927: 420). Aspatharia (Spathopsis) bellamyi (Jousseaume, 1886). — Pilsbry & Bequaert (1927: 420). Aspatharia (Spathopsis) bozasi (Rochebrune & Germain, 1904). — Pilsbry & Bequaert (1927: 420). Aspatharia (Spathopsis) chaiziana (Rang, 1835). — Pilsbry & Bequaert (1927: 420). Aspatharia (Spathopsis) chaiziana var. compressa (Germain, 1906). — Pilsbry & Bequaert (1927: 420). Aspatharia (Spathopsis) clappertoni (Koenig, 1826). — Pilsbry & Bequaert (1927: 420). Aspatharia (Spathopsis) corneola (Rochebrune, 1886). — Pilsbry & Bequaert (1927: 425). Aspatharia (Spathopsis) guillaini (Récluz, 1850). — Pilsbry & Bequaert (1927: 420). Aspatharia (Spathopsis) haasi (Pilsbry, 1923). — Pilsbry & Bequaert (1927: 420). Aspatharia (Spathopsis) innesi (Pallary, 1903). — Pilsbry & Bequaert (1927: 421). Aspatharia (Spathopsis) kirki (Ancey, 1894). — Pilsbry & Bequaert (1927: 421). Aspatharia (Spathopsis) kirki var. liederi (von Martens, 1897). — Pilsbry & Bequaert (1927: 421). Aspatharia (Spathopsis) lacustris (Simpson, 1900). — Pilsbry & Bequaert (1927: 421). Aspatharia (Spathopsis) lacustris var. major (Germain, 1906). — Pilsbry & Bequaert (1927: 421). Aspatharia (Spathopsis) lepsii (Jickeli, 1874). — Pilsbry & Bequaert (1927: 421). Aspatharia (Spathopsis) maitenguensis (Sturany, 1898). — Pilsbry & Bequaert (1927: 421). Aspatharia (Spathopsis) marnoi (Jickeli, 1874). — Pilsbry & Bequaert (1927: 421). Aspatharia (Spathopsis) martensi (Sturany in Baumann, 1894). — Pilsbry & Bequaert (1927: 421). Aspatharia (Spathopsis) martini (Rochebrune, 1904). — Pilsbry & Bequaert (1927: 421). Aspatharia (Spathopsis) nyassaensis (Lea, 1864). — Pilsbry & Bequaert (1927: 422). Aspatharia (Spathopsis) pangallensis (Rochebrune, 1882). — Pilsbry & Bequaert (1927: 422). Aspatharia (Spathopsis) petersi (von Martens, 1860). — Pilsbry & Bequaert (1927: 422). Aspatharia (Spathopsis) petersi modesta (Lea, 1864). — Pilsbry & Bequaert (1927: 422). Aspatharia (Spathopsis) renei (Jousseaume, 1886). — Pilsbry & Bequaert (1927: 422). Aspatharia (Spathopsis) renei var. compressa (Germain in Chevalier, 1907). — Pilsbry & Bequaert (1927: 422). Aspatharia (Spathopsis) rotundata (von Martens, 1897). — Pilsbry & Bequaert (1927: 422). Aspatharia (Spathopsis) rubens (Lamarck, 1819). — Pilsbry & Bequaert (1927: 425). Aspatharia (Spathopsis) rubens var. caillaudi (von Martens, 1866). — Pilsbry & Bequaert (1927: 422). Aspatharia (Spathopsis) rubens var. chudeaui (Germain, 1907). — Pilsbry & Bequaert (1927: 422). Aspatharia (Spathopsis) subaequilatera (von Martens, 1887). — Pilsbry & Bequaert (1927: 422). Aspatharia (Spathopsis) tabula (Sowerby, 1867). — Pilsbry & Bequaert (1927: 422). Aspatharia (Spathopsis) trapezia (von Martens, 1897). — Pilsbry & Bequaert (1927: 422). Aspatharia (Spathopsis) trapezia var. senilis (von Martens, 1897). — Pilsbry & Bequaert (1927: 422). Aspatharia (Spathopsis) wahlbergi (Krauss, 1848). — Pilsbry & Bequaert (1927: 423). Aspatharia (Spathopsis) wahlbergi hartmanni (von Martens, 1866). — Pilsbry & Bequaert (1927: 423). Aspatharia (Spathopsis) wahlbergi var. dorsalis (von Martens, 1897). — Pilsbry & Bequaert (1927: 423). Aspatharia (Spathopsis) wissmanni (von Martens, 1883). — Pilsbry & Bequaert (1927: 423). Aspatharia (Spathopsis) wissmanni bangalorum (von Martens, 1883). — Pilsbry & Bequaert (1927: 424). Corbicula africana (Krauss, 1848). — Pilsbry & Bequaert (1927: 339). Corbicula artini Pallary, 1903. — Pilsbry & Bequaert (1927: 339). Corbicula astartina (v. Martens, 1860). — Pilsbry & Bequaert (1927: 339). Corbicula audoini Germain, 1909. — Pilsbry & Bequaert (1927: 339). Corbicula callipyga Bourguignat, 1885. — Pilsbry & Bequaert (1927: 339). Corbicula cunningtoni E.A. Smith, 1906. — Pilsbry & Bequaert (1927: 339). Corbicula delessertiana Prime, 1870. — Pilsbry & Bequaert (1927: 339). Corbicula difficilis Prime, 1864. — Pilsbry & Bequaert (1927: 339). Corbicula doufilei T. de Rochebrune & Germain, 1904. — Pilsbry & Bequaert (1927: 339). 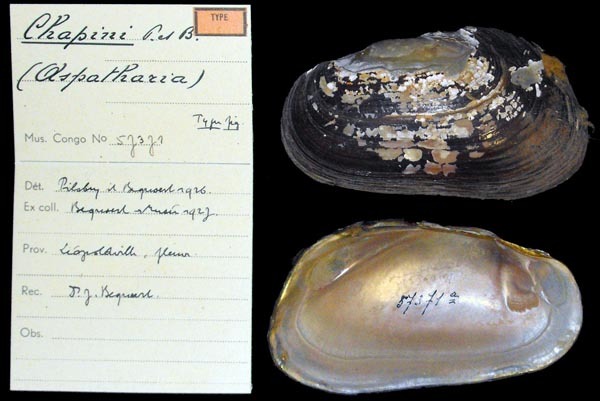 Corbicula fischeri Germain, 1907. — Pilsbry & Bequaert (1927: 339). Corbicula fluminalis (Müller, 1774). — Pilsbry & Bequaert (1927: 344). Corbicula foai Mabille, 1901. — Pilsbry & Bequaert (1927: 345). Corbicula gabonensis Preston, 1909. — Pilsbry & Bequaert (1927: 340). Corbicula gravieriana Bourguignat, 1885. — Pilsbry & Bequaert (1927: 340). Corbicula heuglini Clessin, 1879. — Pilsbry & Bequaert (1927: 340). Corbicula inaequilateralis Prime, 1864. — Pilsbry & Bequaert (1927: 340). Corbicula jickeli Clessin, 1879. — Pilsbry & Bequaert (1927: 340). Corbicula kirkii Prime, 1864. — Pilsbry & Bequaert (1927: 340). Corbicula lacoini Germain, 1905. — Pilsbry & Bequaert (1927: 340). Corbicula meridionalis Clessin, 1879. — Pilsbry & Bequaert (1927: 340). Corbicula natalensis “Krauss” Clessin, 1879. — Pilsbry & Bequaert (1927: 340). Corbicula nilotica Clessin, 1879. — Pilsbry & Bequaert (1927: 340). Corbicula oliphantensis Craven, 1880. — Pilsbry & Bequaert (1927: 340). Corbicula pusilla (‘Parreyss’ Philippi, 1846). — Pilsbry & Bequaert (1927: 340). Corbicula radiata (‘Parreyss’ Philippi, 1846). — Pilsbry & Bequaert (1927: 341). Corbicula radiata edwardi new subspecies. — Pilsbry & Bequaert (1927: 343). 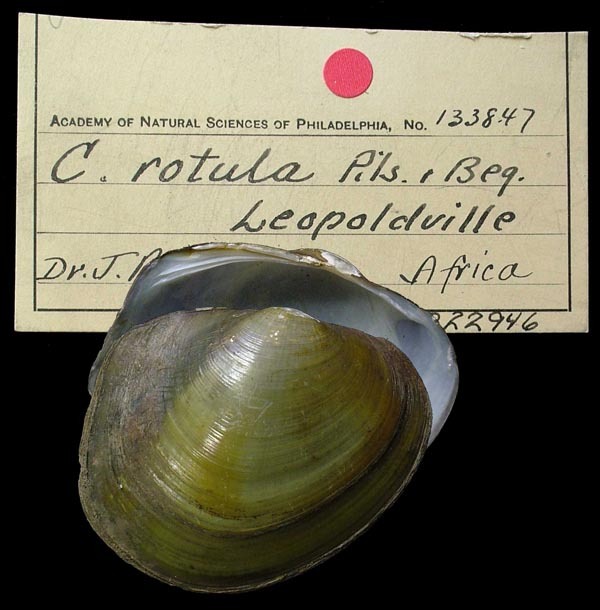 Corbicula senegalensis Clessin, 1879. — Pilsbry & Bequaert (1927: 340). Corbicula soleilleti Bourguignat, 1885. — Pilsbry & Bequaert (1927: 340). Corbicula subtruncata “Bourguignat” Germain, 1906. — Pilsbry & Bequaert (1927: 340). Corbicula subtruncata var. aegyptiaca “Bourguignat” Germain, 1909. — Pilsbry & Bequaert (1927: 340). Corbicula tanganyicensis (Crosse, 1881). — Pilsbry & Bequaert (1927: 343). Corbicula tsadiana E. v. Martens, 1903. — Pilsbry & Bequaert (1927: 341). Corbicula zelebori Jickeli, 1874. — Pilsbry & Bequaert (1927: 341). Cyrenoida dupontia de Joannis, 1835. — Pilsbry & Bequaert (1927: 375). Cyrenoida rhodopyga (E. v. Martens, 1891). — Pilsbry & Bequaert (1927: 375). Cyrenoida rosea (A. d’Ailly, 1896). — Pilsbry & Bequaert (1927: 375). Cyrenoida rosea brevidentata new subspecies. — Pilsbry & Bequaert (1927: 376). Cyrenoida senegalensis (Deshayes, 1854). — Pilsbry & Bequaert (1927: 376). Cælatura [sic] aegyptiaca (Cailliaud, 1827). — Pilsbry & Bequaert (1927: 406). Cælatura [sic] aegyptiaca var. shambiensis (Longstaff, 1914). — Pilsbry & Bequaert (1927: 378). cf. Cælatura [sic] araneosa (Rochebrune, 1886). — Pilsbry & Bequaert (1927: 407). cf. Cælatura [sic] böhmi (von Martens, 1897). — Pilsbry & Bequaert (1927: 407). Cælatura [sic] calathus (Bourguignat, 1885). — Pilsbry & Bequaert (1927: 407). Cælatura [sic] charbonnieri (Bourguignat, 1886). — Pilsbry & Bequaert (1927: 407). Cælatura [sic] gereti (Preston, 1910). — Pilsbry & Bequaert (1927: 407). Cælatura [sic] poirieri (Rochebrune, 1886). — Pilsbry & Bequaert (1927: 407). Cælatura [sic] putzeysi (Preston, 1912). — Pilsbry & Bequaert (1927: 408). Cælatura [sic] randabeli (Bourguignat, 1886). — Pilsbry & Bequaert (1927: 408). Cælatura [sic] sordida (Rochebrune, 1886). — Pilsbry & Bequaert (1927: 408). Cælatura [sic] (Laevirostris) rotula (Pilsbry & Bequaert, 1927). — Pilsbry & Bequaert (1927: 405). Cælatura [sic] (Laevirostris) stagnorum (Dautzenberg, 1890). — Pilsbry & Bequaert (1927: 404). Cælatura [sic] (Laevirostris) stagnorum bomae new subspecies. — Pilsbry & Bequaert (1927: 405). Cælatura [sic] (s.s.) aequatoria (Morelet, 1885). — Pilsbry & Bequaert (1927: 401). Cælatura [sic] (s.s.) briarti (Dautzenberg, 1901). — Pilsbry & Bequaert (1927: 403). Cælatura [sic] (s.s.) elegans (Rochebrune, 1886). — Pilsbry & Bequaert (1927: 400). Cælatura [sic] (s.s.) gerrardi (von Martens, 1897). — Pilsbry & Bequaert (1927: 402). Cælatura [sic] (s.s.) mesafricana (Pilsbry & Bequaert, 1927). — Pilsbry & Bequaert (1927: 402). Cælatura [sic] (s.s.) stanleyvillensis (Pilsbry & Bequaert, 1927). — Pilsbry & Bequaert (1927: 403). Egeria aguiari (Brito Capello, 1878). — Pilsbry & Bequaert (1927: 360). Egeria bengoensis (Dunker, 1848). — Pilsbry & Bequaert (1927: 360). Egeria bengoensis bocagii (Brito Capello, 1878). — Pilsbry & Bequaert (1927: 360). Egeria bengoensis laeta (Philippi, 1849). — Pilsbry & Bequaert (1927: 360). Egeria bernardii (Dunker, 1856). — Pilsbry & Bequaert (1927: 361). Egeria biangulata (Sowerby, 1868). — Pilsbry & Bequaert (1927: 361). Egeria cailliaudi (Bernardi, 1860). — Pilsbry & Bequaert (1927: 361). Egeria chemnitzii (Philippi, 1851). — Pilsbry & Bequaert (1927: 361). Egeria concamerata (Duval, 1840). — Pilsbry & Bequaert (1927: 361). Egeria congica (O. Bœttger, 1885). — Pilsbry & Bequaert (1927: 362). Egeria cumingii (”Dunker” Bernardi, 1860). — Pilsbry & Bequaert (1927: 361). Egeria cumingiiquanzae [sic] (Brito Capello, 1878). — Pilsbry & Bequaert (1927: 362). Egeria heukelomii (Bernardi, 1860). — Pilsbry & Bequaert (1927: 362). Egeria lubackii (Bernardi, 1860). — Pilsbry & Bequaert (1927: 362). Egeria nux new species. — Pilsbry & Bequaert (1927: 367). Egeria paradoxa (Born, 1780). — Pilsbry & Bequaert (1927: 368). Egeria pseudoradiata (Brito Capello, 1878). — Pilsbry & Bequaert (1927: 362). Egeria tenuicula (Philippi, 1849). — Pilsbry & Bequaert (1927: 366). Egeria tenuicula langi new subspecies. — Pilsbry & Bequaert (1927: 366). Egeria triangularis (Sowerby, 1868). — Pilsbry & Bequaert (1927: 362). Egeria truncata (Dunker, 1867). — Pilsbry & Bequaert (1927: 362). Etheria elliptica Lamarck, 1807. — Pilsbry & Bequaert (1927: 449). Eupera bequaerti Dautzenberg & Germain, 1914. — Pilsbry & Bequaert (1927: 358). Eupera ferruginea (Krauss, 1848). — Pilsbry & Bequaert (1927: 355). Eupera letourneuxi Bourguignat, 1883. — Pilsbry & Bequaert (1927: 355). Eupera mediafricana new species. — Pilsbry & Bequaert (1927: 355). Eupera mediafricana etheriarum new subspecies. — Pilsbry & Bequaert (1927: 357). Eupera parasitica (Deshayes, 1854). — Pilsbry & Bequaert (1927: 355). Eupera sturanyi (L. Waagen, 1905). — Pilsbry & Bequaert (1927: 358). Grandidieria burtoni (Woodward, 1859). — Pilsbry & Bequaert (1927: 395). Grandidieria burtoni var. insignis Bourguignat, 1885. — Pilsbry & Bequaert (1927: 396). Grandidieria burtoni var. servainiana Bourguignat, 1885. — Pilsbry & Bequaert (1927: 396). Grandidieria burtoni var. sturanyi (von Martens, 1897). — Pilsbry & Bequaert (1927: 396). Grandidieria callista Bourguignat, 1888. — Pilsbry & Bequaert (1927: 396). Grandidieria elongata Bourguignat, 1885. — Pilsbry & Bequaert (1927: 397). Grandidieria giraudi Bourguignat, 1885. — Pilsbry & Bequaert (1927: 397). Grandidieria gravida Bourguignat, 1885. — Pilsbry & Bequaert (1927: 397). Grandidieria hauttecoeuri Bourguignat, 1885. — Pilsbry & Bequaert (1927: 397). Grandidieria incarnata Bourguignat, 1885. — Pilsbry & Bequaert (1927: 398). Grandidieria mira Bourguignat, 1885. — Pilsbry & Bequaert (1927: 398). Grandidieria rhynchonella Bourguignat, 1888. — Pilsbry & Bequaert (1927: 398). Grandidieria rotundata Bourguignat, 1885. — Pilsbry & Bequaert (1927: 398). Grandidieria smithi Bourguignat, 1885. — Pilsbry & Bequaert (1927: 398). Grandidieria tanganyicensis (Smith, E.A., 1880). — Pilsbry & Bequaert (1927: 399). Grandidieria tanganyicensis var. exalbida (Preston, 1913). — Pilsbry & Bequaert (1927: 399). Grandidieria thomsoni (Smith, E.A., 1880). — Pilsbry & Bequaert (1927: 399). Iphigenia congo new species. — Pilsbry & Bequaert (1927: 373). Iphigenia curta (Dunker, 1867). — Pilsbry & Bequaert (1927: 371). Iphigenia delessertii (Bernardi, 1860). — Pilsbry & Bequaert (1927: 370). Iphigenia lenzi (Dautzenberg, 1891). — Pilsbry & Bequaert (1927: 374). Iphigenia lævigata (Gmelin, 1791). — Pilsbry & Bequaert (1927: 374). Iphigenia messageri (Preston, 1909). — Pilsbry & Bequaert (1927: 371). Iphigenia psammobialis Deshayes, 1854. — Pilsbry & Bequaert (1927: 371). Iphigenia rostrata Rœmer, 1869. — Pilsbry & Bequaert (1927: 372). Iphigenia truncata (E. v. Martens, 1877). — Pilsbry & Bequaert (1927: 371). Iphigenia tumida (E. v. Martens, 1877). — Pilsbry & Bequaert (1927: 371). Iridina (Cameronia) anceyi (Bourguignat, 1885). — Pilsbry & Bequaert (1927: 442). Iridina (Cameronia) bourguignati (‘Ancey’ Bourguignat, 1885). — Pilsbry & Bequaert (1927: 441). Iridina (Cameronia) complanata (Bourguignat, 1886). — Pilsbry & Bequaert (1927: 442). Iridina (Cameronia) dromauxi (Bourguignat, 1886). — Pilsbry & Bequaert (1927: 442). Iridina (Cameronia) giraudi (Bourguignat, 1885). — Pilsbry & Bequaert (1927: 441). Iridina (Cameronia) guillemeti (Bourguignat, 1886). — Pilsbry & Bequaert (1927: 442). Iridina (Cameronia) jouberti (Bourguignat, 1886). — Pilsbry & Bequaert (1927: 442). Iridina (Cameronia) landeaui (Bourguignat, 1886). — Pilsbry & Bequaert (1927: 442). Iridina (Cameronia) locardiana (Bourguignat, 1886). — Pilsbry & Bequaert (1927: 442). Iridina (Cameronia) mabilliana (Bourguignat, 1886). — Pilsbry & Bequaert (1927: 442). Iridina (Cameronia) marioniana (Bourguignat, 1885). — Pilsbry & Bequaert (1927: 442). Iridina (Cameronia) moineti (Bourguignat, 1886). — Pilsbry & Bequaert (1927: 442). Iridina (Cameronia) obtusa (Bourguignat, 1886). — Pilsbry & Bequaert (1927: 442). Iridina (Cameronia) pulchella (Bourguignat, 1886). — Pilsbry & Bequaert (1927: 442). Iridina (Cameronia) randabeli (Bourguignat, 1886). — Pilsbry & Bequaert (1927: 442). Iridina (Cameronia) revoiliana (Bourguignat, 1885). — Pilsbry & Bequaert (1927: 442). Iridina (Cameronia) spekii Woodward, 1859. — Pilsbry & Bequaert (1927: 440). Iridina (Cameronia) vynckei (Bourguignat, 1886). — Pilsbry & Bequaert (1927: 442). Iridina (Pleiodon) diolibana (Bourguignat, 1879). — Pilsbry & Bequaert (1927: 443). Iridina (Pleiodon) elongata (Bourguignat, 1879). — Pilsbry & Bequaert (1927: 443). Iridina (Pleiodon) letourneuxiana (Bourguignat, 1879). — Pilsbry & Bequaert (1927: 443). Iridina (Pleiodon) ovata Swainson, 1823. — Pilsbry & Bequaert (1927: 443). Iridina (Pleiodon) pachyodon (Bourguignat, 1879). — Pilsbry & Bequaert (1927: 443). Iridina (s.s.) exotica Lamarck, 1819. — Pilsbry & Bequaert (1927: 440). Iridina (s.s.) hardeleti (Germain, 1906). — Pilsbry & Bequaert (1927: 440). Iridina (s.s.) hardeleti var. molli (Germain, 1906). — Pilsbry & Bequaert (1927: 440). Iridina (s.s.) tchadiensis (Germain, 1906). — Pilsbry & Bequaert (1927: 440). Mutela (Chelidonopsis) carrei (Putzeys, 1898). — Pilsbry & Bequaert (1927: 438). Mutela (Chelidonopsis) hirundo (von Martens, 1881). — Pilsbry & Bequaert (1927: 438). Mutela (s.s.) aegyptiaca Pallary, 1924. — Pilsbry & Bequaert (1927: 428). Mutela (s.s.) alata (Lea, 1864). — Pilsbry & Bequaert (1927: 428). Mutela (s.s.) alluaudi Germain, 1909. — Pilsbry & Bequaert (1927: 435). Mutela (s.s.) angustata (Sowerby, 1868). — Pilsbry & Bequaert (1927: 435). Mutela (s.s.) angustata var. curta Germain, 1906. — Pilsbry & Bequaert (1927: 428). Mutela (s.s.) angustata var. ponderosa Germain, 1906. — Pilsbry & Bequaert (1927: 428). Mutela (s.s.) bourguignati Bourguignat, 1885. — Pilsbry & Bequaert (1927: 428). Mutela (s.s.) bourguignati var. smithi von Martens, 1897. — Pilsbry & Bequaert (1927: 428). Mutela (s.s.) bourguignati var. truncata von Martens, 1897. — Pilsbry & Bequaert (1927: 428). Mutela (s.s.) chevalieri Germain, 1904. — Pilsbry & Bequaert (1927: 435). Mutela (s.s.) complanata (Jousseaume, 1886). — Pilsbry & Bequaert (1927: 428). Mutela (s.s.) complanata mut. abbreviata (Germain, 1907). — Pilsbry & Bequaert (1927: 429). Mutela (s.s.) complanata mut. elongata (Germain in Chevalier, 1907). — Pilsbry & Bequaert (1927: 429). Mutela (s.s.) complanata var. curta (Germain, 1907). — Pilsbry & Bequaert (1927: 429). Mutela (s.s.) dubia (Gmelin, 1791). — Pilsbry & Bequaert (1927: 430). Mutela (s.s.) emini von Martens, 1897. — Pilsbry & Bequaert (1927: 435). Mutela (s.s.) falemeensis (Germain, 1907). — Pilsbry & Bequaert (1927: 429). Mutela (s.s.) garambae Pilsbry & Bequaert, 1927. — Pilsbry & Bequaert (1927: 431). Mutela (s.s.) garambae praetenuis new subspecies. — Pilsbry & Bequaert (1927: 432). Mutela (s.s.) hargeri Smith, E.A., 1908. — Pilsbry & Bequaert (1927: 434). Mutela (s.s.) iris Pilsbry & Bequaert, 1927. — Pilsbry & Bequaert (1927: 434). Mutela (s.s.) joubini (Germain, 1904). — Pilsbry & Bequaert (1927: 436). Mutela (s.s.) langi Pilsbry & Bequaert, 1927. — Pilsbry & Bequaert (1927: 432). Mutela (s.s.) lavigeriana Bourguignat, 1886. — Pilsbry & Bequaert (1927: 436). Mutela (s.s.) lhotelleriana Preston, 1909. — Pilsbry & Bequaert (1927: 429). Mutela (s.s.) mabilli (Rochebrune, 1886). — Pilsbry & Bequaert (1927: 433). Mutela (s.s.) mabilli var. frasi (Germain, 1907). — Pilsbry & Bequaert (1927: 429). Mutela (s.s.) mabilli var. gaillardi (Germain, 1909). — Pilsbry & Bequaert (1927: 429). Mutela (s.s.) monceti Bourguignat, 1886. — Pilsbry & Bequaert (1927: 436). Mutela (s.s.) nilotica (Cailliaud, 1823). — Pilsbry & Bequaert (1927: 436). Mutela (s.s.) nilotica var. moineti Bourguignat, 1886. — Pilsbry & Bequaert (1927: 437). Mutela (s.s.) opalescens Preston, 1910. — Pilsbry & Bequaert (1927: 429). Mutela (s.s.) oudnoei Koenig, 1826. — Pilsbry & Bequaert (1927: 429). Mutela (s.s.) plicata (von Martens, 1866). — Pilsbry & Bequaert (1927: 429). Mutela (s.s.) rostrata (Rang, 1835). — Pilsbry & Bequaert (1927: 430). Mutela (s.s.) simpsoni Ancey, 1894. — Pilsbry & Bequaert (1927: 430). Mutela (s.s.) singularis Pallary, 1924. — Pilsbry & Bequaert (1927: 430). Mutela (s.s.) soleniformis Bourguignat, 1885. — Pilsbry & Bequaert (1927: 437). Mutela (s.s.) subdiaphana Bourguignat, 1883. — Pilsbry & Bequaert (1927: 430). Mutela (s.s.) welwitschii (Morelet, 1868). — Pilsbry & Bequaert (1927: 430). Parreysia acuminata (Adams, H., 1866). — Pilsbry & Bequaert (1927: 393). Parreysia bakeri (Adams, H., 1866). — Pilsbry & Bequaert (1927: 392). Parreysia horei (Smith, E.A., 1880). — Pilsbry & Bequaert (1927: 393). Parreysia leopoldvillensis (Putzeys, 1898). — Pilsbry & Bequaert (1927: 390). Parreysia lobensis Frierson, 1913. — Pilsbry & Bequaert (1927: 383). Parreysia lourdeli (Bourguignat, 1887). — Pilsbry & Bequaert (1927: 394). Parreysia mweruensis (Smith, E.A., 1908). — Pilsbry & Bequaert (1927: 392). Parreysia ngesiana (von Martens, 1897). — Pilsbry & Bequaert (1927: 389). Parreysia regis Pilsbry & Bequaert, 1927. — Pilsbry & Bequaert (1927: 389). cf. Parreysia rothschildi (Neuville & Anthony, 1906). — Pilsbry & Bequaert (1927: 385). Parreysia stuhlmanni (von Martens, 1897). — Pilsbry & Bequaert (1927: 390). cf. Parreysia tsadianus (von Martens, 1903). — Pilsbry & Bequaert (1927: 386). Parreysia ujijiensis (Crosse, 1881). — Pilsbry & Bequaert (1927: 394). Pisidium giraudi Bourguignat, 1885. — Pilsbry & Bequaert (1927: 354). Pisidium hermosum Bourguignat, 1888. — Pilsbry & Bequaert (1927: 352). Pisidium katangense new species. — Pilsbry & Bequaert (1927: 353). Pisidium kenianum Preston, 1911. — Pilsbry & Bequaert (1927: 350). Pisidium landeroini Germain, 1909. — Pilsbry & Bequaert (1927: 351). Pisidium langleyanum Melvill & Ponsoby, 1891. — Pilsbry & Bequaert (1927: 351). Pisidium ovampicum Ancey, 1890. — Pilsbry & Bequaert (1927: 351). Pisidium pirothi Jickeli, 1881. — Pilsbry & Bequaert (1927: 351). Pisidium ruwenzoriense Germain, 1911. — Pilsbry & Bequaert (1927: 351). Pseudavicula johnstoni (Smith, E.A., 1893). — Pilsbry & Bequaert (1927: 408). Pseudocorbicula alluaudi Dautzenberg, 1908. — Pilsbry & Bequaert (1927: 359). Pseudospatha bourguignati (‘Joubert’ Bourguignat, 1886). — Pilsbry & Bequaert (1927: 447). Pseudospatha ortmanni Pilsbry & Bequaert, 1927. — Pilsbry & Bequaert (1927: 446). Pseudospatha stappersi Pilsbry & Bequaert, 1927. — Pilsbry & Bequaert (1927: 446). Pseudospatha subtriangularis (Bourguignat, 1886). — Pilsbry & Bequaert (1927: 447). Pseudospatha tanganyicensis (Smith, E.A., 1880). — Pilsbry & Bequaert (1927: 444). Pseudospatha tanganyicensis livingstoniana (Bourguignat, 1883). — Pilsbry & Bequaert (1927: 445). Soleilletia abbadiana Bourguignat, 1885. — Pilsbry & Bequaert (1927: 346). Soleilletia hamyana Bourguignat, 1885. — Pilsbry & Bequaert (1927: 346). Sphaerium abyssinicum Pollonera, 1898. — Pilsbry & Bequaert (1927: 347). Sphaerium boccardi Pollonera, 1898. — Pilsbry & Bequaert (1927: 347). Sphaerium capense (Krauss, 1848). — Pilsbry & Bequaert (1927: 349). Sphaerium congener Preston, 1912. — Pilsbry & Bequaert (1927: 348). Sphaerium courteti Germain, 1904. — Pilsbry & Bequaert (1927: 348). Sphaerium courteti var. marginatum Germain, 1908. — Pilsbry & Bequaert (1927: 348). Sphaerium hartmanni (Jickeli, 1874). — Pilsbry & Bequaert (1927: 348). Sphaerium iredalei Preston, 1912. — Pilsbry & Bequaert (1927: 348). Sphaerium kigeziense Preston, 1912. — Pilsbry & Bequaert (1927: 348). Sphaerium mohasicum J. Thiele, 1911. — Pilsbry & Bequaert (1927: 349). Sphaerium naivashaensis Preston, 1912. — Pilsbry & Bequaert (1927: 348). Sphaerium nyanzae E.A. Smith, 1892. — Pilsbry & Bequaert (1927: 350). Sphaerium pharaonum “Bourguignat” Pallary, 1909. — Pilsbry & Bequaert (1927: 348). Sphaerium stuhlmanni E. v. Martens, 1897. — Pilsbry & Bequaert (1927: 348). Sphaerium subcapense Bourguignat, 1883. — Pilsbry & Bequaert (1927: 348). Sphaerium teilhardi Pallary, 1909. — Pilsbry & Bequaert (1927: 348). Sphaerium victoriæ E.A. Smith, 1906. — Pilsbry & Bequaert (1927: 348). Sphaerium vinosum Dupuis, 1924. — Pilsbry & Bequaert (1927: 348). Unio abyssinicus von Martens, 1866. — Pilsbry & Bequaert (1927: 378). Unio aeneus Jickeli, 1874. — Pilsbry & Bequaert (1927: 378). Unio aferula Lea, 1864. — Pilsbry & Bequaert (1927: 378). Unio africanus Lea, 1856. — Pilsbry & Bequaert (1927: 378). Unio alfierianus Bourguignat, 1885. — Pilsbry & Bequaert (1927: 378). cf. Unio decampsianus Wattebled, 1884. — Pilsbry & Bequaert (1927: 380). cf. Unio dembeae Sowerby in Reeve, 1865. — Pilsbry & Bequaert (1927: 380). cf. Unio diminutus Lea, 1859. — Pilsbry & Bequaert (1927: 380). cf. Unio duponti (Rochebrune, 1881). — Pilsbry & Bequaert (1927: 380). Unio fayumensis Pilsbry & Bequaert, 1927. — Pilsbry & Bequaert (1927: 381). cf. Unio hauttecoeuri Bourguignat, 1883. — Pilsbry & Bequaert (1927: 381). cf. Unio hermosus Bourguignat, 1889. — Pilsbry & Bequaert (1927: 382). cf. Unio ilqi Bourguignat, 1885. — Pilsbry & Bequaert (1927: 382). cf. Unio jeanneli Germain, 1913. — Pilsbry & Bequaert (1927: 382). cf. Unio jickeli (Simpson, 1900). — Pilsbry & Bequaert (1927: 382). cf. Unio juliani Rang, 1835. — Pilsbry & Bequaert (1927: 382). cf. Unio lacoini Germain, 1906. — Pilsbry & Bequaert (1927: 383). cf. Unio lechaptoisi Ancey, 1894. — Pilsbry & Bequaert (1927: 383). cf. Unio mandinguorum (Rochebrune, 1882). — Pilsbry & Bequaert (1927: 383). cf. Unio natalensis Lea, 1864. — Pilsbry & Bequaert (1927: 384). cf. Unio niloticus Cailliaud, 1827. — Pilsbry & Bequaert (1927: 384). cf. Unio nyassaensis Lea, 1864. — Pilsbry & Bequaert (1927: 384). cf. Unio parreyssi ‘v. d. Busch’ Philippi, 1847. — Pilsbry & Bequaert (1927: 385). cf. Unio ratidotus Charmes, 1885. — Pilsbry & Bequaert (1927: 385). cf. Unio silongweensis Preston, 1912. — Pilsbry & Bequaert (1927: 385). cf. Unio teretiusculus Philippi, 1847. — Pilsbry & Bequaert (1927: 386). cf. Unio verreauianus Lea, 1856. — Pilsbry & Bequaert (1927: 386). Unio (Cafferia) caffer Krauss, 1848. — Pilsbry & Bequaert (1927: 379). Unio (Cafferia) caffer var. pentheri Sturany, 1898. — Pilsbry & Bequaert (1927: 379). Unio (Cafferia) connollyi Pilsbry, 1923. — Pilsbry & Bequaert (1927: 380).